Directions Gently rub shave gel over wet skin to produce a rich lather for a smooth shave. 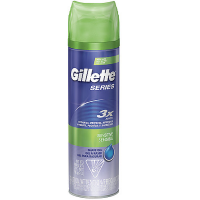 Uses The lightly fragranced gel, with advanced lubricants, provides incredible razor glide for protection against nicks and cuts. For great results use with Gillette Venus razors. Warnings Contents under pressure. Do not place in hot water or near radiators, stoves or other sources of heat. Do not puncture or incinerate container or store at temperatures above 48 degrees C/120 degrees F. KEEP OUT OF REACH OF CHILDREN.